The Serene Stamper: Win a trip to San Diego from Stampin' Up! Win a trip to San Diego from Stampin' Up! Hi Friends! I can't believe it's been over a week since I last posted! I've been a busy beaver, lemme tell ya. This past week I had stamp clubs, classes, my 1st ever Spring Fling Customer Appreciation Party and of course, this was also the last week of Sale-a-bration! So many of you took advantage of this awesome yearly promotion and got yourselves some wonderful bundles AND free SAB products! Sale-a-bration is the best time of year to stock up on your favourites, get your wish list items (ie. the Big Shot!) and in doing so, you received bonus gifts of limited edition stamps and accessories for FREE! Also, between my "Serene Stampers" team and I, we had 20 ladies buy the starter kit, thus becoming members of my stamping group and I'm thrilled for each of you! Not only did you get the best deal of all, but you are going to LOVE being a part of the Stampin' Up! family as well as my group! My Serene Stampers group has a ton of fun together! 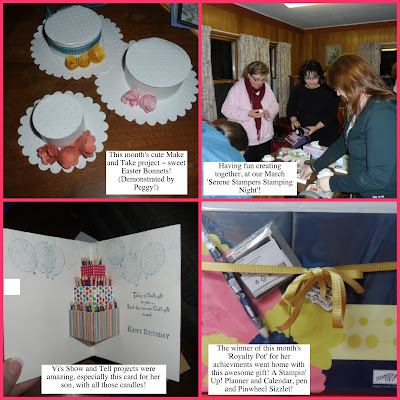 Each month we meet up for stamping, demonstrations, make and takes, rewards and recognition, door prizes, show and tell display tables, card swaps, yummy treats and lots more! If you'd like to come as my guest you are more than welcome to! Just let me know by contacting me at serenestampers@gmail.com. Our next gathering is April 26, 7-9pm. The Easter Egg Goodie Pouch from this month's Stamp Clubs was also a hit and I'll be posting a video of it on Tuesday, so everyone will still have time to whip some of these cuties up for Easter. 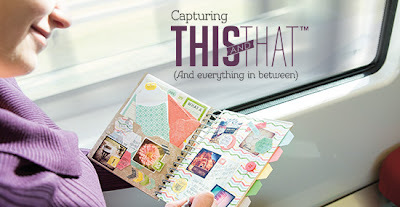 But today's post is really all about "THIS AND THAT" - something I am soooooooo EXCITED to share with you! This is a new product line from Stampin' Up! and I predict it's going to be a massive hit! Check it out and I'm sure you're going to agree! Your life is: Awesome. Quirky. Exciting. Perfectly messy. And happening really fast. So we're happy to introduce our newest product line that lets you capture it all on-the-go. This and That will be in the 2013-2014 annual catalogue, but you don't have to wait, you can get it now! But if you don''t order it by April 30, you will have to wait until the new catalogue comes out. 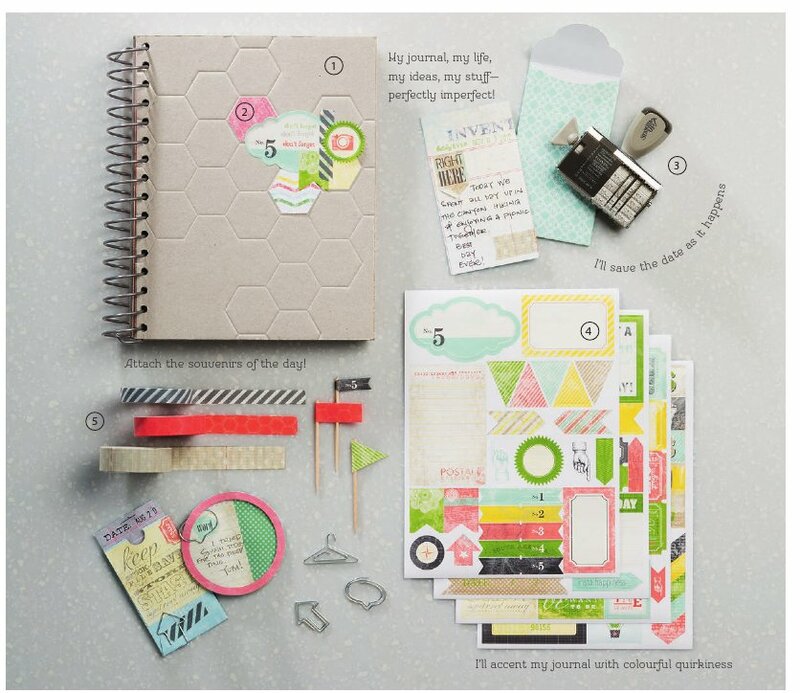 Gifts for your scrapbooker friends! Get one for you and your BFF to make together! Or even better, grab your friends and come to my This and That Class on April 20th and everyone can make their journals together! Just bring you pictures and momentos and all the supplies for your This and That Journal will be waiting for you! I'll even bring the treats! Contact me at serenestamper@gmail.com to RSVP your spot! Lookey at these FUN new products!!!!! Includes the five This and That Products listed above. I've already ordered my kit and I am just itchin' to play with it!!! It's going to be a blast! If you want one too (and seriously, why wouldn't you????) simply click on this link to have your This and That Bundle delivered right to your door. Or, just contact me and I'll be happy to order one for you. a trip to San Diego! One GRAND PRIZE winner will receive round trip airfare for two to San Diego and accommodations at the luxurious US Grant Hotel September 12-15. From world-famous Sea World to the San Diego Zoo, there is an array of exciting things to do in this charming, seaside city.